as you relax and de-stress in your room or on the deck. an area that enjoys a relatively warm climate throughout the year. 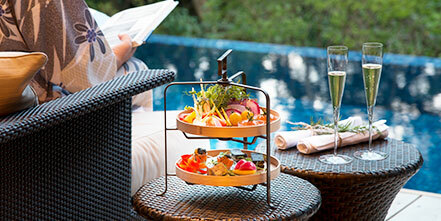 All the villas at the resort include an open-air bath, and four of our villas have a swimming pool. Two of the most recently constructed villas are double-storied structures that contain a private sauna, jacuzzi and a kitchen where our chef can create special meals for you. 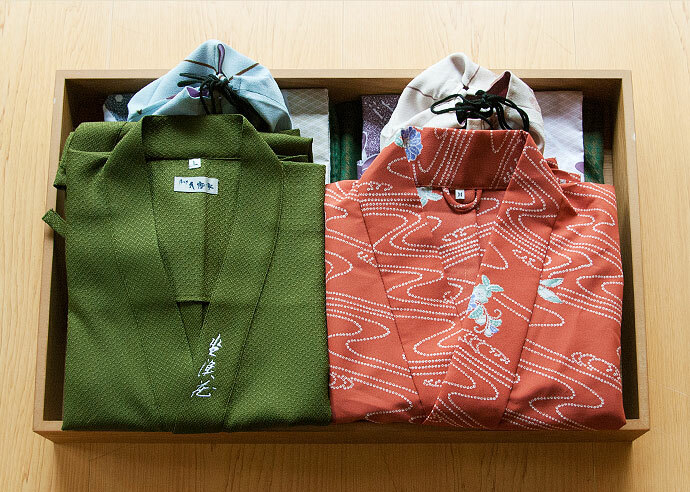 The comfortable and spacious interiors have a relaxing and modern Japanese ambience. Guests will feel perfectly at home in these villas. a spacious living room and bedroom with an extended roof deck equipped with deckchairs. 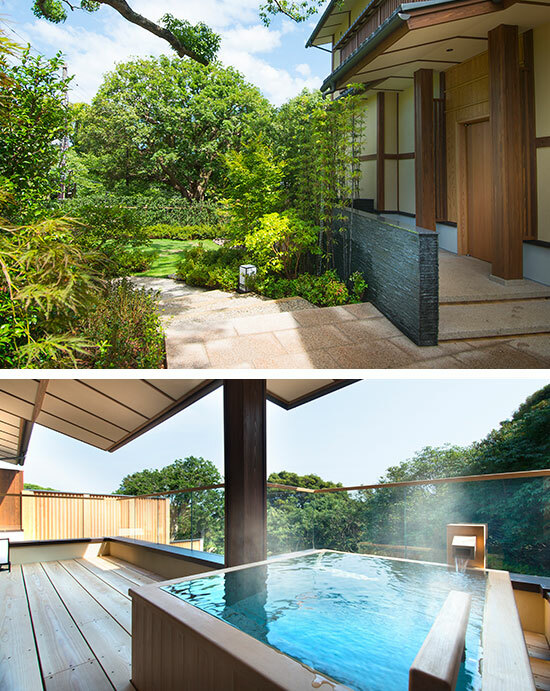 The roof deck leads to an open-air bath. Two new villas have been introduced at the resort in 2018. 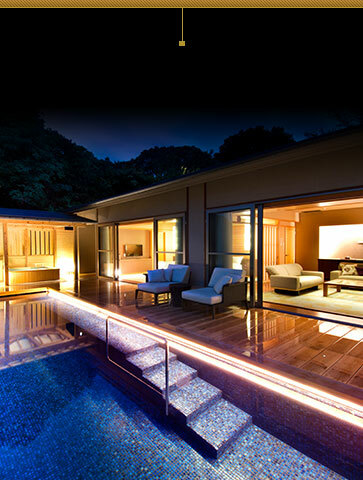 Both villas are equipped with a split-level living space, private heated pool, open-air bath, sauna, and private kitchen. brings you precious moments of peace. 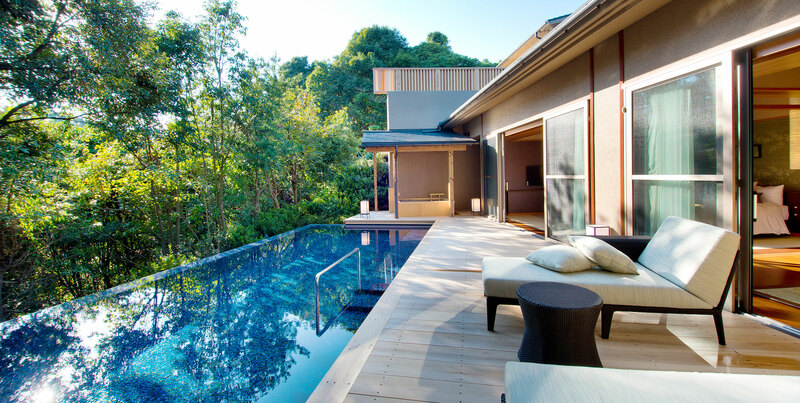 The villas are surrounded by greenery and freshened by cool highland air that revitalizes you. These villas resemble vacation homes and are nestled in the scenic beauty of Stewartia, Benthamidia, Japanese maples, and other seasonal plants. Inside our villas, guests can relax in a spacious area that includes a living room, a bedroom, and a roof deck that leads to an open-air bath. The flower basin facing the garden is also a beautiful sight that will calm your soul. Only Villa KARIN (No.308) and RENGE (No.310) are bariier-free. Enjoy the scenes floating in the water, the atmosphere of silence, spreading through the trees and the sky, and the shining moon in the evening. 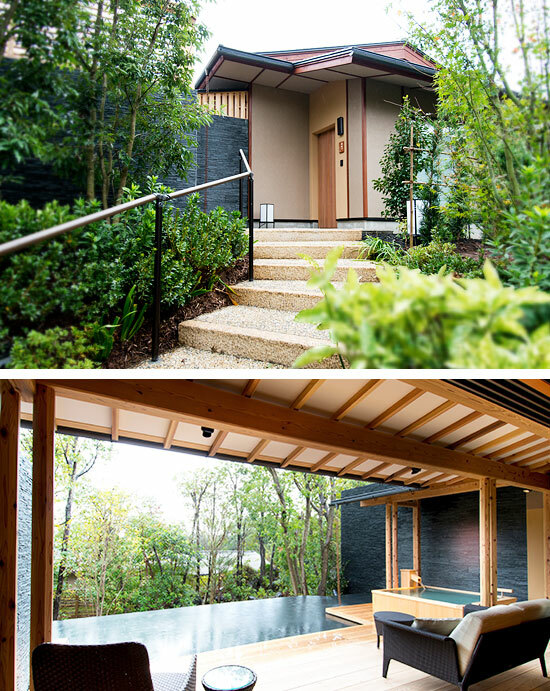 The Ukiyama Hot Springs has long been a popular vacation spot, and the ABBA villa suite is located in the midst of nature snuggled inside a bamboo forest. 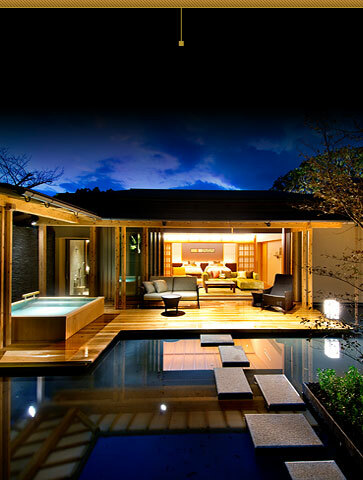 There are two villas in this area, and both villas have a swimming pool and an open-air bath. The balcony looks out over the swimming pool, giving the villa a fun resort-like feel. 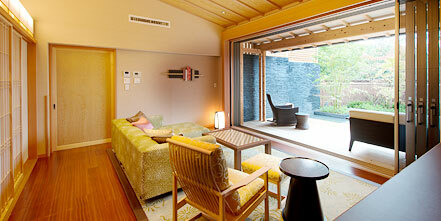 Both the living room and bedroom face the garden, making the villa feel open and refreshing. Take a nap on one of the deck chairs or in the living room. The facilities and comfort of the villa suite will make you lose track of time. *This type of villas are not barrier-free. We offer two new villas with a split-level living space, your own private heated pool with water from the mineral springs, and an open-air jacuzzi located on the first floor. These villas have private kitchens that are adjacent to the living rooms. A chef is also at your disposal to fulfill your gourmet desires. 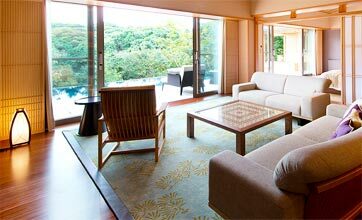 The bedroom is located on the second floor and looks out on Sagami Bay. 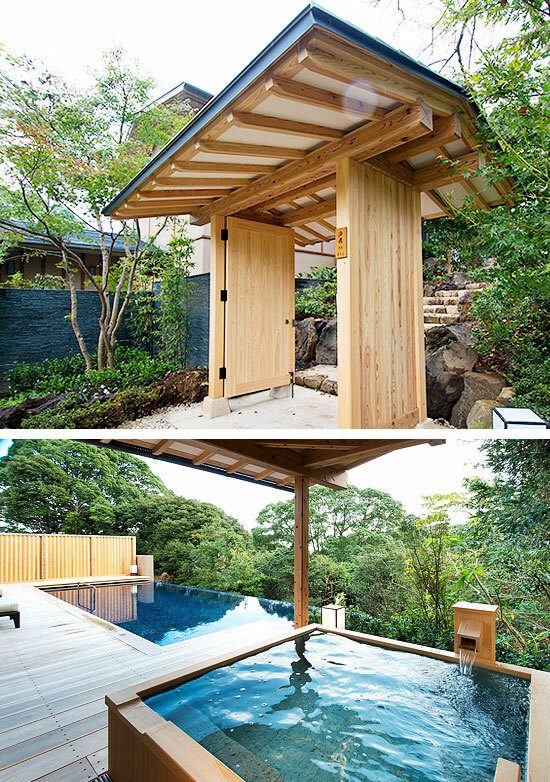 The large open-wood deck has an outdoor mineral bath and a sauna. *Private swimming pool at the Villa room is heated except summer time. *Unfortunately our hotel is not handicap accessible except Villa KARIN and RENGE. All rooms are non-smoking. However, villas are only allowed to smoke in the deck space. Children below 12 years old are available only during Family days. Please refer to the Family days.